This lusciously smooth non-dairy and egg-free holiday cheesecake is flavored with molasses, ginger, cinnamon and clove and baked in a gingersnap crust. If desired, top with non-dairy whipped cream (from my Non-Dairy Evolution Cookbook) and a dusting of cinnamon before serving. This is my signature cheesecake recipe and technique, and as far as I know, is unique in vegan cheesecake preparation because premade non-dairy cream cheese is not required – the cheesecake filling is created in one easy step. However, the proper baking items are required for success, so please follow the recipe and technique as written. The filling also requires two specialty ingredients which can be obtained from ModernistPantry.com. These ingredients are also commonly used in vegan cheese making (please see my Non-Dairy Evolution Cookbook for cheese recipes). 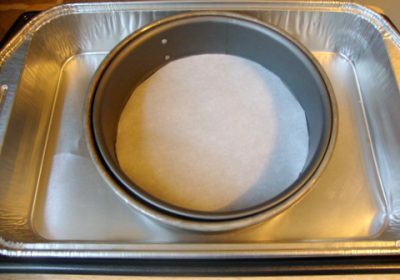 Trace the circumference of the bottom of the springform pan on parchment paper and cut. Assemble the springform pan and spray the interior with cooking oil. Line the bottom with the parchment paper and mist the paper with cooking oil. 8” springform pan lined with parchment paper; 9” cake pan to prevent water from entering springform pan; and aluminum roasting pan for bain-marie set on baking sheet for support. Position an oven rack in the middle of the oven. Preheat the oven to 325°F/165°C. Process the gingersnap cookies and softened butter/margarine in a food processor until finely ground. Add the crumbs to the oiled and lined springform pan and pack evenly on the bottom and halfway up the sides. Set aside. Add the dry raw cashews to a blender with the soymilk and process on high speed for 2 full minutes. Add the remaining filling ingredients EXCEPT for the lactic acid and process until thoroughly blended. With the blender running, add the lactic acid all at once. The mixture will immediately thicken and stop turning in the blades – turn the blender off. Pour the filling into the springform pan and gently shake the pan side to side or tap the sides to release any air bubbles and help the filling settle. Place the springform pan into the cake pan and set the cake pan into the bain-marie. DO NOT use aluminum foil as an alternative to the cake pan for preventing water from leaking into the springform pan. Water will condense inside the foil and ruin the cheesecake. Trust me on this one. If using an aluminum roasting pan for the bain-marie, place it on a large baking sheet for support and for ease transferring to and from the oven. Pour very hot tap water into the bain-marie halfway up the sides of the cake pan. Be careful not to splash water into the cheesecake filling. Transfer to the oven and bake for 1 hour and 45 minutes. When complete, turn the oven off but leave the cheesecake in the oven for 15 minutes with the oven door slightly ajar (if needed, use an oven mitt to hold the door ajar). Remove from the oven and carefully remove the cake pan from the water bath. Let the cheesecake cool to room temperature and then remove from the cake pan and release from the springform mold. Leave the cheesecake on the bottom of the springform mold and transfer to the storage container. Seal and refrigerate until thoroughly chilled. To transfer the cheesecake to a serving plate, carefully slide a thin flexible spatula between the parchment paper and the crust and slide onto the plate. Moisten a knife with warm water to slice the cheesecake. Top with non-dairy whipped cream and a dusting of cinnamon before serving, if desired. Store the cheesecake in the sealed container in the refrigerator. Not too fluffy and yet not too dense, this lusciously smooth non-dairy cheesecake captures the flavor of holiday eggnog without the eggs and without the dairy. 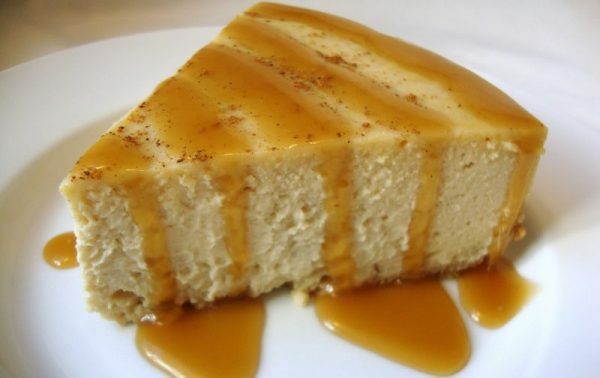 This is my signature cheesecake recipe and technique, and as far as I know, is unique in vegan cheesecake preparation because premade non-dairy cream cheese is not required – the cheesecake filling is created in one easy step. However, the proper baking items are required for success, so please follow the recipe and technique as written. The filling also requires two specialty ingredients which can be obtained from ModernistPantry.com. 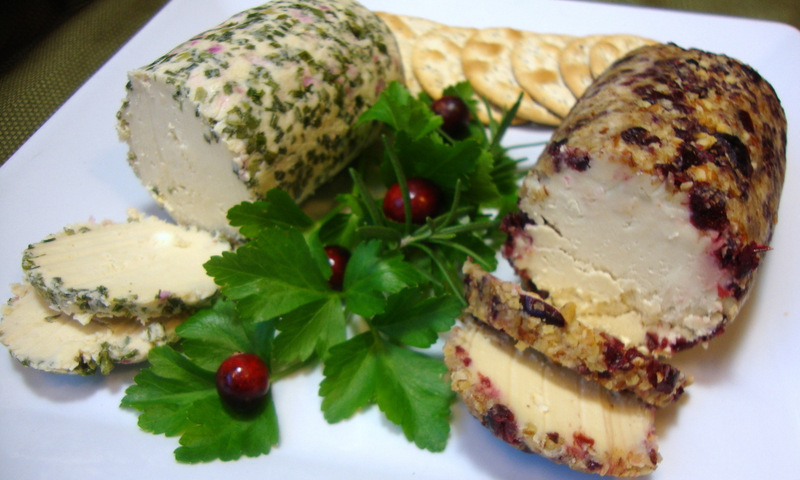 These ingredients are also commonly used in vegan cheese making (please see my Non-Dairy Evolution Cookbook for cheese recipes). Trace the circumference of the bottom of the springform pan on parchment paper and cut. Assemble the springform pan and spray the interior generously with cooking oil. Line the bottom with the parchment paper and mist the paper with cooking oil. 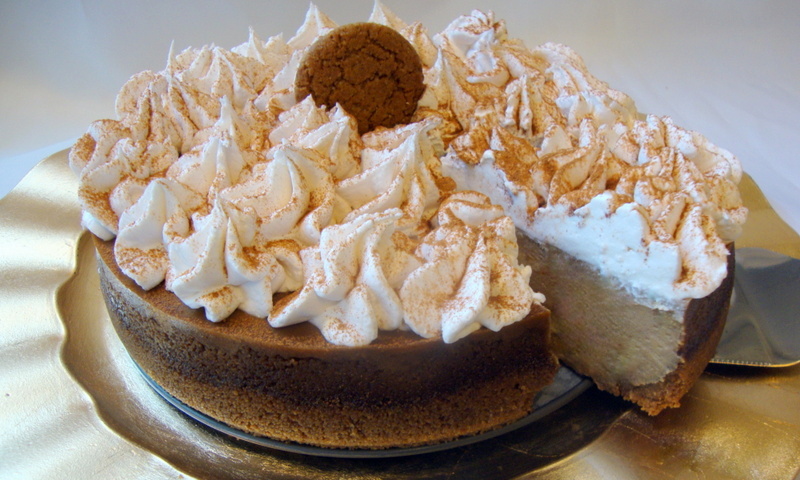 Process the graham cracker crust in a food processor until finely ground. Alternately, crush the crust into crumbs in a large bowl. Add the crumbs to the oiled and lined springform pan and pack evenly on the bottom and halfway up the sides. The oiled pan will help the crumbs stick to the sides. Set aside. About an hour before serving, prepare the sauce. Add the sauce ingredients to a small saucepan and bring to a brief boil while swirling the saucepan contents occasionally. Watch carefully or the sauce may boil over. Immediately reduce to a simmer and cook for exactly 4 minutes, again swirling the contents occasionally. Set aside to cool at room temperature. To transfer the cheesecake to a serving plate, carefully slide a thin flexible spatula between the parchment paper and the crust and slide onto the plate. Moisten a knife with warm water to slice the cheesecake. Drizzle individual slices with the sauce. Store the cheesecake in the sealed container in the refrigerator. *Baby spinach, kale, Swiss chard and mizuna were used for the photo. For the dressing, simmer the pomegranate juice in a small saucepan until reduced to approximately ¼ cup. Cool and chill until ready to make the dressing. Add the pomegranate reduction and the remaining dressing ingredients to a shaker jar and shake until emulsified. Chill thoroughly. Shake the jar thoroughly again before using. 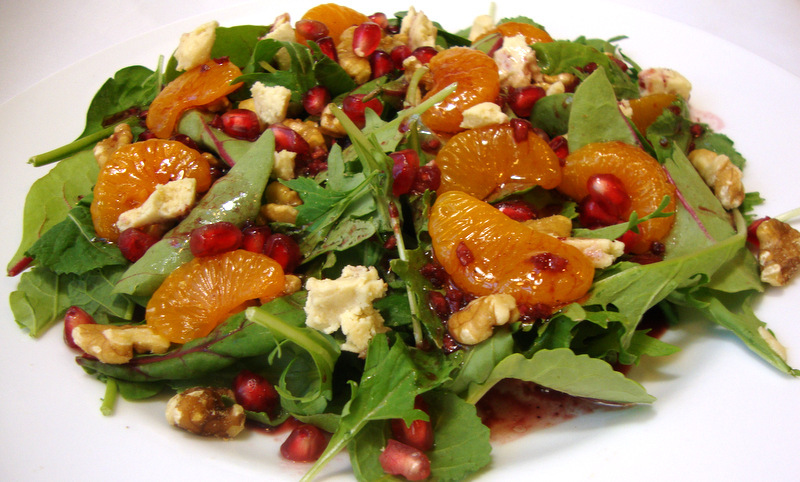 Arrange the salad ingredients on individual plates and drizzle with the dressing; season with salt and pepper to taste. 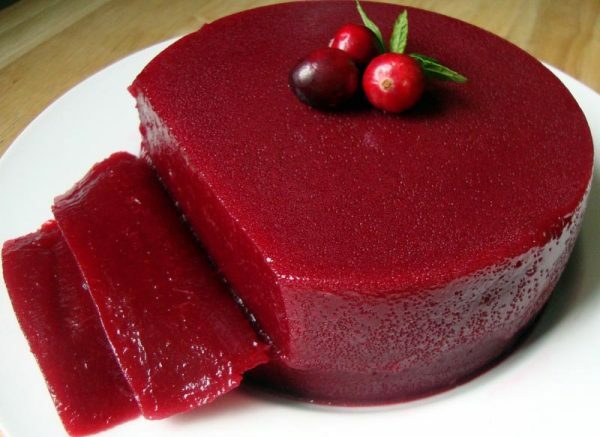 A whole-fruit jellied cranberry sauce made with organic sugar (commercial jellied sauce is typically made with corn syrup) and flavored with Port wine or pomegranate juice – or try fresh orange juice for a citrus flavor. Place the silicone mold on a small plate. Examine the cranberries and remove any stray stems. Rinse them and place in a medium saucepan (reserve a few cranberries for garnish if desired). Sprinkle the sugar over the cranberries and the agar powder over the sugar. Add the wine (or juice) and water. Bring to a boil and then reduce to a simmer for 10 minutes, stirring occasionally. You may hear the berries audibly pop as they cook. Watch the cooking pot so the mixture doesn’t boil over. Transfer the hot mixture to a blender. Cover and begin blending on low speed gradually increasing to high for 1 minute. If your blender doesn’t have variable speed settings, cover and hold the lid with a kitchen towel to prevent hot liquid from explosively erupting from the blender. Transfer the mixture to the mold and let cool. Cover with plastic wrap and refrigerate for several hours or until thoroughly chilled and set. Remove the plastic wrap and run a dull table knife around the perimeter to loosen the jellied sauce (be careful not to damage the mold). Invert a serving plate over the mold and then flip the two plates over to release the jellied sauce. Garnish with the fresh cranberries and a sprig of fresh mint if desired. Serve cold. Colcannon is a traditional Irish dish consisting of creamy, buttery mashed potatoes and tender cooked kale seasoned with green onions, salt, pepper and parsley. Peel and cut the potatoes into large chunks. Immediately immerse the cut potatoes in 4 quarts of water. Add 1 tablespoon of salt and bring to a boil. Cook until fork tender, about 8 to 10 minutes. While the potatoes are cooking, flash sauté the kale and green onions with the olive oil in a large skillet until the kale is wilted and tender. Transfer to a bowl and set aside. Drain the potatoes in a colander and then transfer to a large mixing bowl or back to the cooking pot. Mash the potatoes with the butter and hot milk. Add salt and pepper to taste. Stir in the sautéed kale and green onions. Transfer the colcannon to a serving dish and garnish with the parsley. 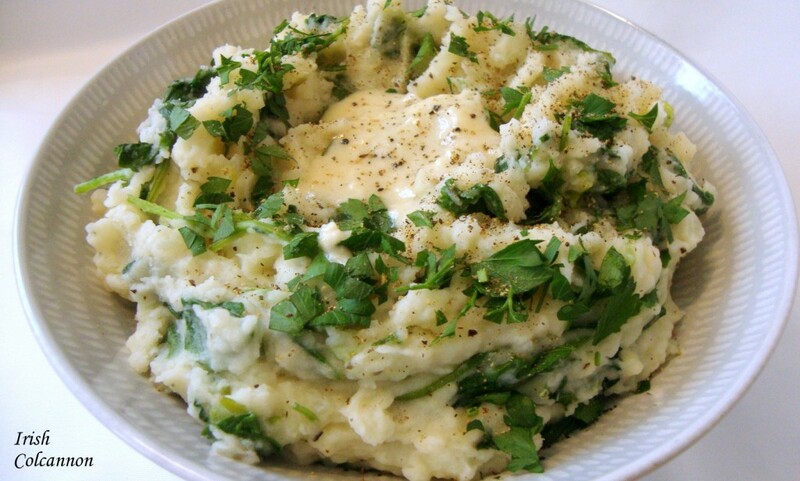 Make a well in the center of the colcannon and garnish with a tablespoon or two of melted butter or margarine. Serve immediately.